We just wanted to share quick post to thank everyone for coming to visit Rosehill at CRE North last week. It was the first time that CRE has returned to the North since 2014 so it was highly anticipated by all. The exhibition was over 2 days on the 13th and 14th March, and are pleased to say that we had a busy couple of days. We met with Current customers, and new, including Church leaders and decision makers from all over the North of England. It was a great opportunity for us to network and show of some of our best-selling Church furniture. We snapped a few images from the show for anyone who didn’t attend. As you can see by the amount of furniture we exhibited, it’s a great opportunity to sample some furniture before taking the plunge and purchasing. We took with us a large selection of metal and wooden chairs, stacking chairs, trolleys and dolleys, tables and even lecterns. 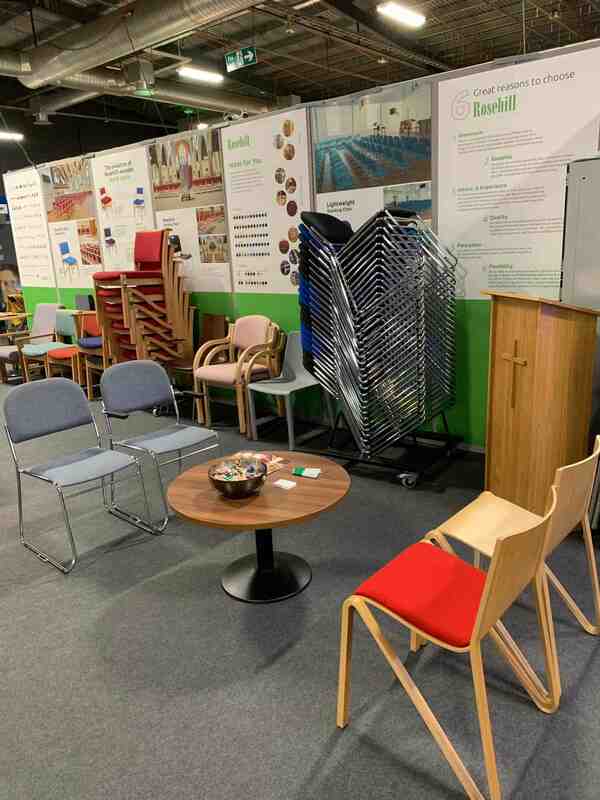 Remember though, if you couldn’t make CRE and you’re interested in sampling some of our Church furniture, you can still get in touch with our sales team to explore your options. Alternatively, you can read our blog on our sampling services and furniture showroom.